It has been said that whilst getting the script for Bad Times at the El Royale picked up by a studio, the film’s director and screenwriter Drew Goddard was so secretive about the project that he would only allow the studios to read his script on his own iPad. Expectation for the film was high. The first images and trailers seemed to show that we were in for a first class slice of Americana with all the classic 60’s influences clearly on display; from the stylish big chrome cars through the decoration of the El Royale, and a solid 60’s soundtrack to boot. The trailer gave hints of being a thriller/horror in disguise with the hotel as much of a cast member as the list of unlikely guests at the El Royale. 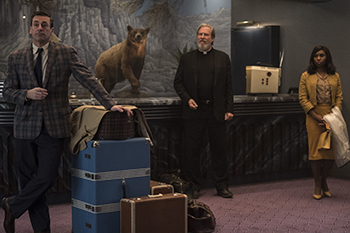 Bad Times at The El Royale could almost sound like a knock-knock joke with its cast of a travelling salesman, doo-wop girl and priest walking into a bar, but this time it’s a mystery hotel straddling an increasingly ominous red painted line which at first only appears in the parking lot outside but actually continues on inside the hotel. This serves as the state line separating the two sides of our establishment between California and Nevada… but is this all the redline represents? 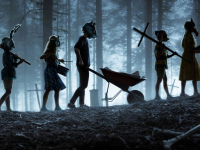 Goddard’s directorial debut was none other than horror fan favourite The Cabin in the Woods, which also had a large sense of suspense about it. From the film’s production & marketing campaign, Cabin and its secrets were extremely well guarded, which these days is a seemingly impossible task, when remembering that Drew managed to release Cabin without the brilliance of the final act being leaked online. This fact lends to the expectation that Bad Times would aim similarly to string us along whilst dropping hints at the real story. Having this to compare with, we can be forgiven for expecting some first rate twists & turns from Bad Times at The El Royale. With a star-studded cast including a host of Hollywood A-listers; Jeff Bridges (TRON: Legacy, The Big Lebowski) playing Farther Daniel Flynn giving as solid a performance as ever as our friendly Priest with likely questionable motives. Next up we get Jon Hamm (Mad Men, Baby Driver) fitting the role of a travelling salesman perfectly, with dry satirically overly polite manor and trim appearance, Hamm’s character becomes instantly likeable and scores our first laugh of the movie. A relative new comer but none the less talented, Cynthia Erivo portrays Darlene Sweet, a backing singer experiencing hard times just trying to get by, and is the odd one out in our collection of rogues. Having enough talent to be a female solo artist but putting up with terribly low wage and thinly veiled racism, Darlene is only at the El Royale because it’s cheap, and she is in the wrong place at the wrong time. Dakota Johnson (Fifty Shades of Grey) is Emily Summerspring, a charming young lady that really is in a hurry and knows exactly what she wants, with her younger hellion sister Rose, portrayed by Cailee Spaeny. The Summerspring sisters have, I feel, clearly under developed roles on display here, and obviously a lot has transpired to get Emily into the position we find her. Perhaps redacted to service the running time of the picture, I feel elements of this back story could have served her and other character’s stronger development. Moving on, Lewis Pullman’s turn as Miles Miller, receptionist, barman, valet and the keeper of all secrets at the El Royale, is perhaps the most interesting and well-rounded member of the cast. With Miles, we thankfully do get a fleshed out background, allowing us to understand him better, offering reasons behind his working at the El Royale and why somebody would work at the hotel by choice. Finally we arrive at Chris Hemsworth (Thor franchise) playing the most mysterious member of the ensemble, Billy Lee. Unfortunately, it is with Billy that I find the lack of a detailed back story most impactful, as he is clearly a very opinionated fellow and an important story element as he portrays a cult leader of sorts. However, details of how he got to his lofty status of head nutcase would have been interesting and allowed for more fear factor. 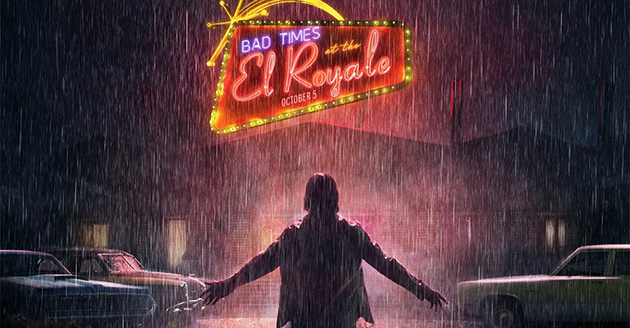 In closing I felt that, despite some twists and turns Bad Times at The El Royale is much like a neon hotel sign; it has a bright, attractive allure but it falls into the forgettable pile quickly for me. 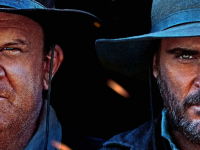 The film has been compared to the often genius works of Quentin Tarantino due to its scenes of long dialog, great soundtrack and stylish cinematography, but Tarantino this isn’t. With a truly great cast both in front of the camera and behind it, the movie still ends leaving us feeling unfulfilled and as though something is missing. Maybe there is a director’s cut to be had or perhaps the studio want a prequel/sequel or both, showing more of the sordid events at the El Royale, but only time will tell.